It’s a rare brand that gets a museum devoted to it, much less a museum that’s reviewed in The New York Times. 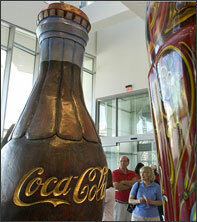 With the opening of its New World of Coca-Cola museum in Atlanta (replacing an earlier incarnation), Coke has achieved this status. Writing in the Times, critic Edward Rothstein notes a few “misjudgments of tone,” including the enshrinement in a lobby of the less-than-effervescent homily, “To Refresh the World, Mind and Spirit; To Inspire Moments of Optimism Through Our Brands and Our Actions; To Create Value.” For the most part, though, he seems to find the place interesting, if not exactly admirable. (That’s as much as can be said of many museums.) Rothstein takes special note of the Advertising Theater, where vintage and foreign commercials reflect the company’s obsession “with getting everyone everywhere to love it.” At the end of his kulturkritikal journey, Rothstein arrives in a gallery where taps dispense the company’s sodas. “I filled and refilled my cup, drinking with my fellow Cokatarians in faithful communion.” Cokatarians? No doubt the company will trademark the word and somehow make money off it.